I have a 2003 Rav4 with the 1AZ-FE 4 cylinder engine. I just had to put in a new catalytic converter and also had to replace one of the A/F Sensors. After replacing the catalytic converter, it threw a P1150 code. So I put in a sensor from Advance Auto, drove the car about 50 miles, reset the code and it threw the same one again. I exchanged the sensor at Advance Auto thinking it might just be a bad sensor. Drove the car about 80 miles, reset the code and P1150 again. So this time, I got the genuine Toyota replacement because I heard that sometimes the after market items aren't as good. Did the same things again. Same code again. Replaced the Toyota sensor with another one. Same thing, P1150. So now I'm thinking it could be electrical. Can anyone assist me with how to trouble shoot an electrical issue with an A/F sensor? How and what do you test? Wiring diagram, etc. Anything would help at this point. I'm pulling what hair I have left out! Check if MAF sensor is dirty. Also check if PVC valve is bad. Let us know if this cures things. Will do. I don't currently have the RAV4 with me. It may be a while before I can check these things. It does have about 150,000 miles on it so this could be the issue. But why throw a P1150 code? You would think there would be a code for the MAF at least. You have two upstream air/fuel ratio sensors. Which one did you replace? The one on the driver's side or the one on the passenger side? The sensor on the driver's side is for cylinders 1 and 4. The sensor on the passenger side is for cylinders 2 and 3. You should have replaced the sensor on the passenger side. These sensor do not interchange. The connectors are different. I replaced the one on the passenger side (upper one). This is the one that was indicated by the P1150 code. I'll clean the MAF and put in a new PCV valve this weekend and then post my results. What exactly does a P1150 code state? To obtain a high purification rate for the CO, HC and NOx components of the exhaust gas, a three-way catalytic converter is used. But, for the most efficient use of the three-way catalytic converter, the air-fuel ratio must be precisely controlled so that it is always close to the stoichiometric air-fuel ratio. The A/F sensor has the characteristic that provides output voltage* approximately proportional to the existing air-fuel ratio. The A/F sensor output voltage* is used to provide feedback for the ECM to control the air-fuel ratio. By the A/F sensor output, the ECM can determine the deviation amount from the stoichiometric air-fuel ratio and control the proper injection time immediately. If the A/F sensor is malfunctioning, ECM is unable to perform accurate air-fuel ratio control. The A/F sensor is equipped with a heater which heats the zirconia element. The heater is controlled by the ECM. When the intake air volume is low (the temp. of the exhaust gas is low), current flows to the heater to heat the sensor for accurate oxygen concentration detection. *: The voltage value changes at the inside of the ECM only. Bank 1 refers to the bank that includes cylinder No.1. Bank 2 refers to the bank that includes cylinder No.2. Sensor 1 refers to the sensor closet to the engine body. If DTC P1130, is displayed, check Bank 1 Sensor 1 circuit. If DTC P1150, is displayed, check Bank 2 Sensor 1 circuit. After confirming DTC P1130 use the OBD II scan tool or TOYOTA hand-held tester to confirm the voltage output of the A/F sensor (AFS B1 S1/02S B1 S1) from the CURRENT DATA. The A/F sensor's output voltage and the short-term fuel value can be read using the OBD II scan tool or TOYOTA hand-held tester. The ECM controls the voltage of AF1A+/AF2A+ and AF1A-/AF2A- terminals of the ECM to the fixed voltage. Therefore, it is impossible to confirm the A/F sensor output voltage without the OBD II scan tool or TOYOTA hand-held tester. Here is a snip of the sensor locations. Since you used a Denso sensor, and other brands have produced the same results, I think you can safely rule out a bad sensor. The wiring is suspect next. Cleaning the MAF sensor and replacing the PCV valve will not correct this code. If there were faults with either the MAF sensor or PCV valve, you would also have a code P1130. 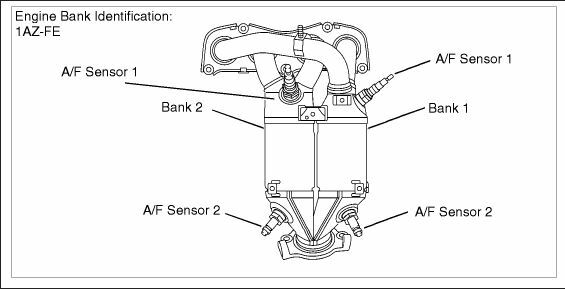 The MAF sensor cannot affect two cylinders nor can the PCV valve. Thanks Fixit. That was my thoughts. I did go ahead and clean the MAF and put in a new PCV just in case. These two things needed it anyway. It did bring the idle down a few ticks which was good. So would anyone be able to assist me with how to go about testing the wiring. I know the coupling has 4 wires and they ultimately go back to the ECM/ECU but I wouldn't have a clue as to how and test them. No one knows how to test the connectors electrical properties? Any input on testing would be appreciated. Not testing the A/F sensor but the plug/wiring for it going from the connector (4 wires) to the ECM.